Offering suet at a backyard feeding station is a great way to attract a wide variety of insect-eating birds. Birds that eat suet will still find natural food sources such as insects, insect eggs and grubs to get a well-rounded diet. 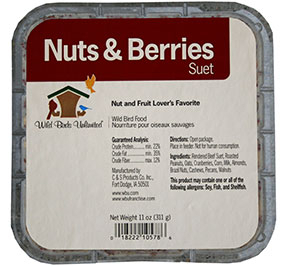 Since suet can be messy to put into the cages, try freezing the suet before putting it in the feeder. This will make the cake contract, allowing it to fit in the cage more easily and reduce waste. 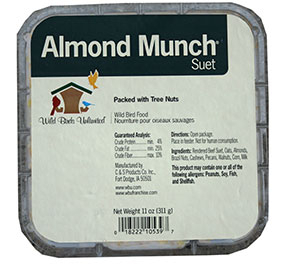 Avoid the mess of melted suet. 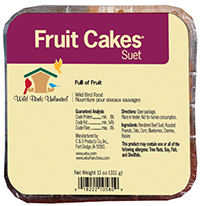 Offer No-melt suet when seasonal temperatures are above 95º F and Suet when temperatures are below 95ºF. 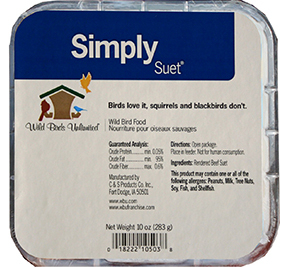 All of our Suet and No-melt suet is rendered and refined to remove impurities that cause spoilage. 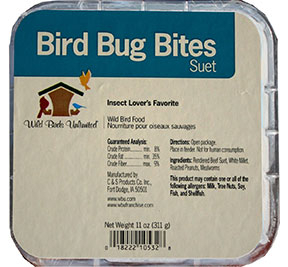 No-melt suet is designed to withstand temperatures up to 130° F.
Made of all beef fat that has been rendered four times, so it is the purest form, with peanuts and dried mealworms, Bird Bug Bites is sure to please your feathered friends. I find that especially in the winter, when bugs are hardest to find, they clean this one out in a hurry! Attractive to all suet eating birds, especially woodpeckers, creepers, and chickadees. 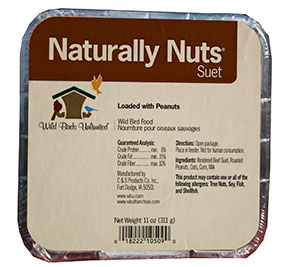 Suet is a high-energy, pure fat substance that is invaluable to birds. 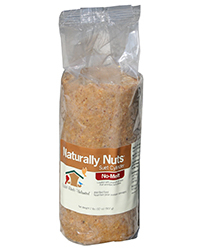 Our Naturally Nuts® Suet is loaded with lots of yummy nuts, and birds such as woodpeckers, chickadees and nuthatches love to eat it. Peanut Butter'n Jelly® Suet mimics the old childhood favorite, but without the sticky after effects. The peanut butter appeals to birds that like insects and nuts, while the "jelly" (blueberries) attracts fruit-eating birds. Woodpeckers, titmice, chickadees, nuthatches, orioles, bluebirds and others enjoy this high-energy food. Simply pu, this is PURE beef fat and nothing else. The suet eating birds are still attracted to this one but the squirrels and blackbirds (grackles, starlings, etc) are not interested. 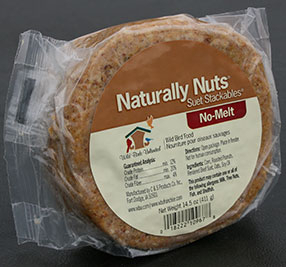 NOW available in a SUET cake (not just no-melt). A backyard bird favorite this one has peanuts, blueberries, cherries, and raisins. 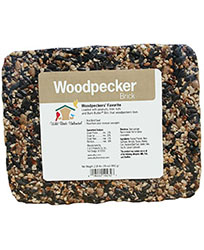 Lots of protien and fat you can help your birds all year with this treat. NEW! This one is FULL of nuts! Almonds, pecans and walnuts to be exact. 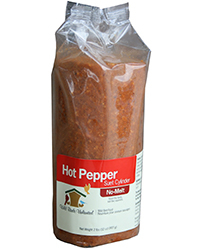 Along with our pure beef fat this one will keep your birds going all winter! 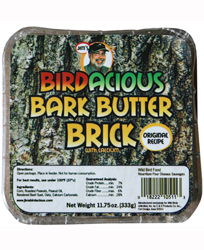 Jim’s Birdacious® Bark Butter® is already enjoyed by more than 100 different bird species. Now we have Bark Butter® Bricks. 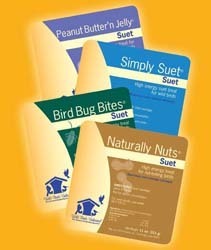 They are the same size/shape as a suet cake and very easy to use. Just place one in any suet cake or tail prop feeder to attract a variety of birds, including many that do not normally visit feeders. This is a holiday favorite, although you could certailnly serve this anytime of the year and the birds will thank you. 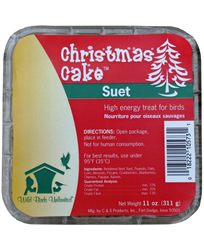 The Christmas suet cake paired with any of our suet feeders would make a great gift for any nature lover! 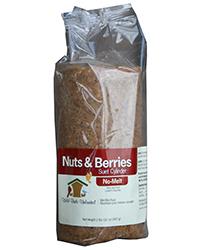 This seed cake will fit in any basic suet cage. a good fit for anyone who wants a low maintenance feeding option. The seeds are held together with a gelatin so the cake holds up well in poor weather conditions. 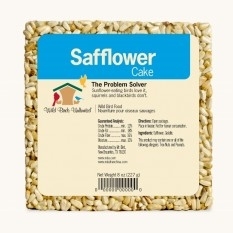 Safflower is less desirable to both blackbirds and squirrels. 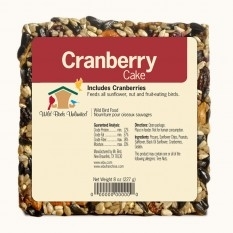 This is the same blend as the rest of our Cranberry Fare varieties (cylinder, wreath, bell) and follows suit as one of our best selling cakes. The birds absolutely LOVE this blend. Fits in any basic suet cage. If you haven't tried anything cranberry give this one a try. You won't be disappointed by the display of birds. 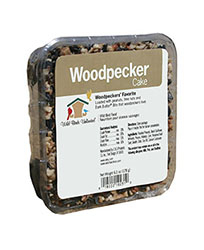 This is our "woodpecker" blend (which actually attracts much more than just woodpeckers) in a regular size cake. Fits in any basic suet cage. 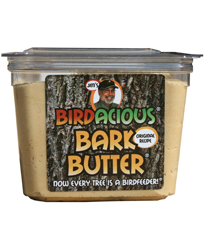 The birds love the Bark Butter® Bits that are in this blend! This cake is meant for use in our Picnic Basket Feeder, a larger version of a basic suet cage. I like to use it in my window tray feeder, or any open tray feeder. It's less messy than using loose birdseed and it attracts a large variety of species. 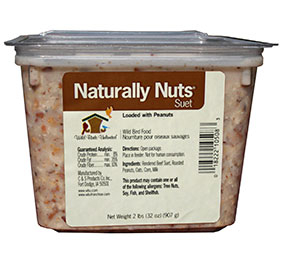 This is our classic Naturally Nuts® suet recipe whipped up into a tub (the size of three suet cakes)and meant for use in the Triple Basket Suet Cage. It makes feeding a little easier as you shouldn't have to fill the feeder quite as often. The birds really love this recipe and it provides much needed nourishment throughout the year. 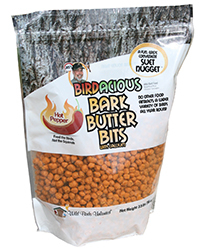 Jim’s Birdacious® Bark Butter® Bits are bite-sized nuggets made of rendered beef suet, soy oil, roasted peanuts, corn, oats and calcium carbonate. Bark Butter® Bits allow you to easily offer Bark Butter® in tray, seed tube, mesh peanut and hopper feeders. Just add them to your feeder to attract a variety of birds, including many that do not normally visit feeders. These are the same Bark Butter® Bits, but infused with hot pepper to keep the squirrels away. Mix them in with your favorite seed blend or serve them alone. You're sure to see some excited and happy birds! 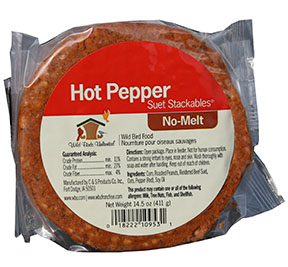 Same formula as our other Hot-pepper varieties, now in stackable™ size. The squirrels will not care for this one. 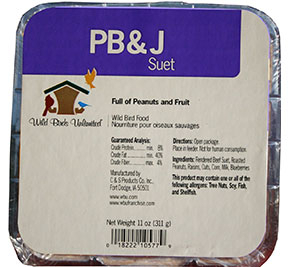 Made of peanut butter, peanuts, rendered beef suet, corn, oats, calcium carbonate, raisins and blueberries, this No-Melt Suet Cylinder is an easy, long-lasting way to offer a high-energy, high-fat food to clinging and perching birds. Peanut Butter ‘n Jelly® No-Melt Suet Cylinders also contain calcium to promote stronger eggs. 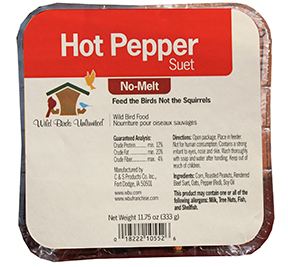 Made of corn, roasted peanuts, rendered beef suet, oats, red pepper and soy oil, the Hot Pepper No-Melt Suet Cylinder is perfect for enticing a wide variety of birds to your yard, while deterring squirrels. 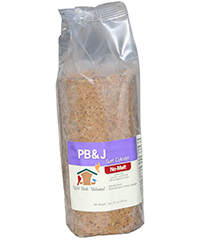 Here's another convenient way to offer Jim's Birdacious® Bark Butter® with calcium, the bird food that has attracted more than 100 different bird species. 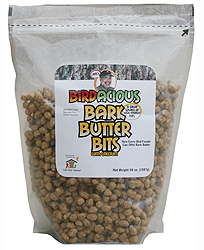 Place Bark Butter Plugs in a suet plug feeder or a suet cage. 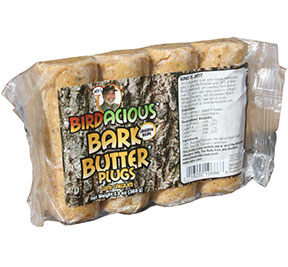 Bark Butter Plugs can also be crumbled and used as a treat on the Jim's Birdacious TreatTray® to attract woodpeckers, jays, bluebirds and many more.